Our Berkeley Bath Rug Set by Chesapeake Merchandising features an updated brick design that will enrich any space with distinctive style. A bold, but timeless pattern that will add just the right amount of color to your bathroom decor. The design coupled with the colors creates a look that brings a beautiful neutral set of colors to your bathroom. When you want to bring a natural, earthy tone to your bathroom decor, this is the bath rug set to choose. Plush fabric machine tufted from 100% cotton cushions your feet for pure comfort. Its water-absorbent construction ensures lasting quality, while a lightly sprayed anti-skid backing helps keep your rugs securely in place. The 2 piece set Includes a 21"x 34" and 24"x 40"rug. THESE RUGS SHED SO BADLY I WAS AFRAID THAT THERE WOULD NOT BE MUCH OF THEM LEFT AFTER WASHING THEM. BUT, THEY CAME OUT OF THE DRYER IN ONE PIECE AND SOFT, THEY DO FLATTEN OUT WHEN STEPT ON. I WOULD NOT PURCHASE AGAIN. Looks lovely in the bathroom but when I washed it the first time I was surprised with how much it shed. These are high quality rugs that feel great under your feet. Rubber backed with no slip material.The brick pattern is slightly raised and the tan color scheme that I purchased is true to the photos. We recently updated our bathroom with some of the colors in the rugs and wanted something different. Love them and have received lots of compliments! Very nice bath set. I love the colors. I painted my bathroom and this set matches perfectly. I would recommend this bath rug set. My only complaint is it slides a little on the floor when I'm get out of the shower. 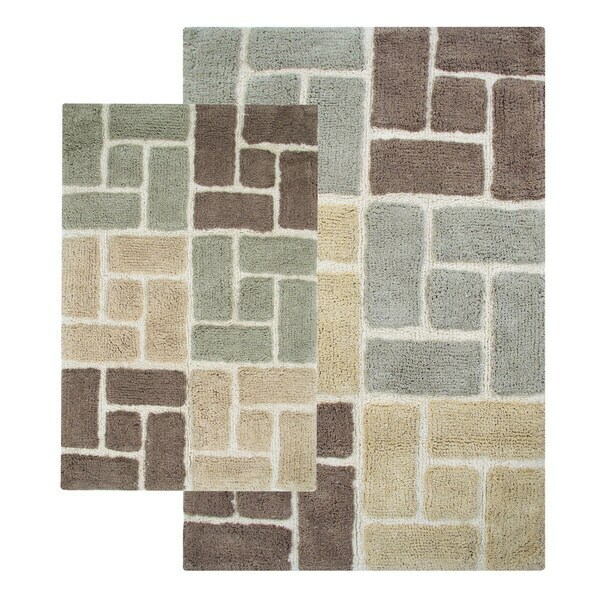 This set of bath rugs are striking in design and colors. I found only one feature I didn't like--the size. The larger rug is too big for my small bathroom, so I had to put it in another room. I ordered these because I repainted my bathroom and the true color of the tub really stood out and looked out of place. These rugs had a nice color combination of browns that toned down the yellowish color of the tub. Good quality. I've had them for several years now and they are in great shape. Not your Ordinary Bath Mats!! I had just a white rug in my bathroom. When I saw this one I couldn't wait. I got the adobe set and it brings my bathroom to life. I really liked this product. I love the colors that were matched in this set. I am using it in the bath and the vanity area and it looks great. Just what I wanted. I did a lot of looking around before selecting these rugs. The subtle colors are lovely, and the quality of the rugs is very good. They made the finishing touch for my new bathroom scheme. Highly recommended! Great rugs for bathroom. Wash up great, and fluff back up after washing. Very soft. Love these rugs that are all cotton. They stay put without slipping! Nice neutral colors. Washes well. I love these rugs! They are stylish and look great in my bathroom! This is the second set of these rugs ive purchased. I got the Spa color which look great. They wash well and are thick and do not slip. Happy with this buy. Great accent to my bathroom. I love them. Love the colors. Have washed them once without problem. Nice & cushioney. I would definitely order this set again. Well worth the price. Exactly what I was Looking for, color-wise. Colors muted and 'muddy' from what expected. It is beautiful, plush and ideal for my bathroom renovation. I spent hours looking online for the right rugs and when I saw it, I fell in love. "I cannot seem to be able to bring up the measurements of each of these rugs. Can someone help me?" The small rug dimensions are 21 inches wide x 34 inches long. The large rug dimensions are 24 inches wide x 40 inches long. The step out mat dimensions are 17 inches wide x 24 inches long. All dimensions are approximate. "Is the bonus step out mat the same design and color as the other two?" No it's white with off white small circle in the middle. "In the spa rugs, in addition to the white, are the colors gray or blue? Also, is the third color beige, tan or gold? Thanks, I'm not sure if I can trust my monitor regarding the colors." Hello jbhieb5, the Spa design features spa blue and beige coloring, in my opinion. Please feel free to contact us again with any further questions. Thank you for shopping with us! "What is the backing, if any on these rugs?" Hello margaret, the rugs have a latex backing. Thanks for shopping with us! "Can I order 2 pieces of the same size of 21 x 32. I do not need the bigger size. I have a shower stall not a tub shower. Thank you." Hello Joyssie8, we do apologize, the sets are unable to be customized. Thank you for shopping with us.